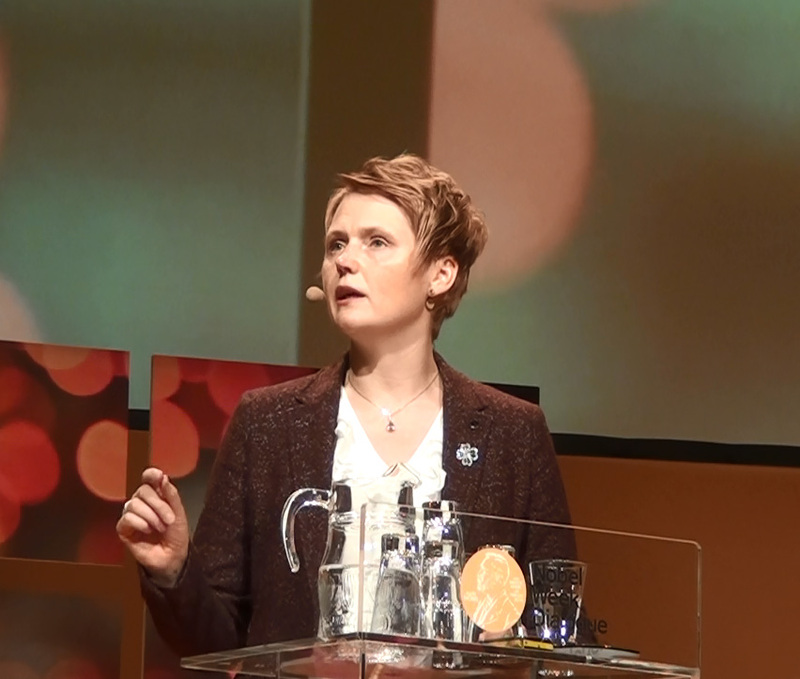 For the second time a dialogue has been organised during the Nobel Prize week and this time it was in Gothenburg. 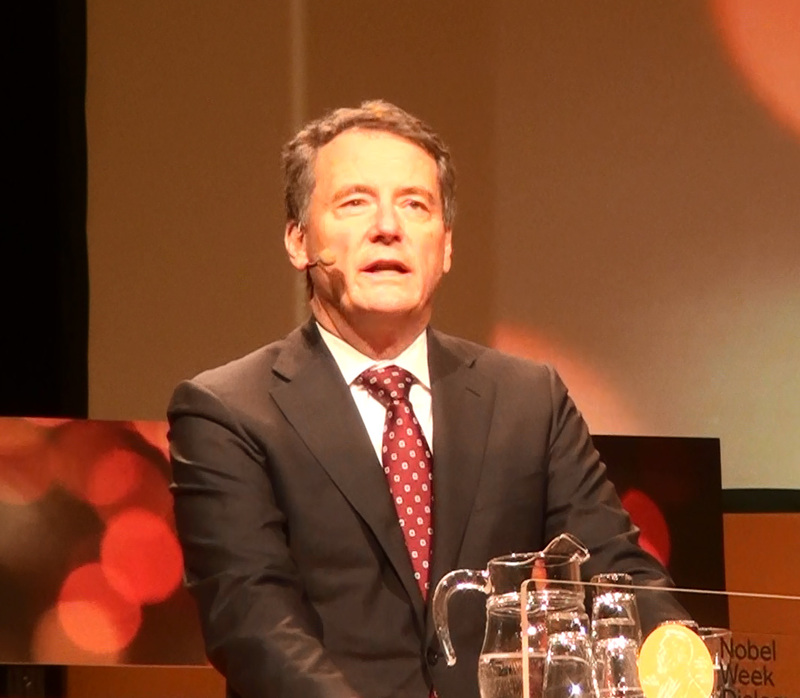 The idea of the event is that one should take advantage of the unique opportunity that a number of Nobel Prize winners, other leading researchers, leaders of industry and politicians are gathered in Sweden for the Nobel Prize festivities. The theme for the dialogue this year was the future of energy and I felt honoured to be invited to participate. It was especially enjoyable for me to be in Gothenburg since this is the city in which I was born and studies. However, the reason for my invitation was my research on global energy systems. The invitees began the day with a joint breakfast. For the breakfast the organisers had invited David MacKay as speaker. He is an energy advisor to the UK government and he has also written a very educational book on energy, “Sustainable Energy – Without The Hot Air”. Two years ago I was invited to London and I met David MacKay to discuss Peak Oil. My book, “Peeking at Peak Oil” existed in PDF form at that time but had not yet been printed. He was one of the first to receive a printed copy during this event. David MacKay began by discussing biofuels for our cars. It was a presentation packed with numbers and I am certain that it was difficult for many to follow. 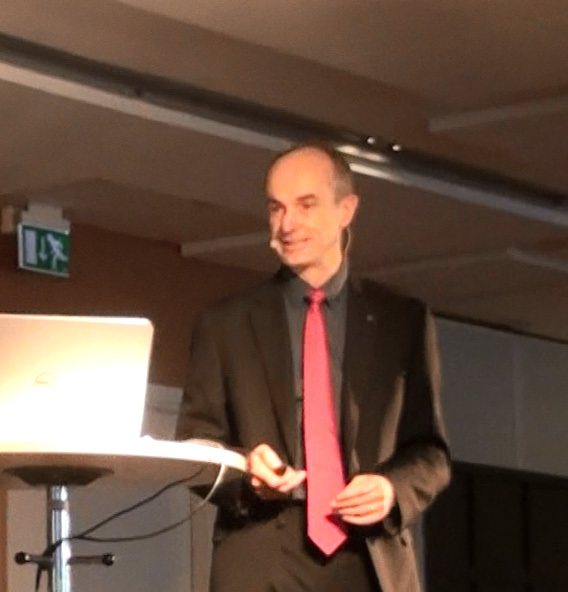 Fortunately, I recorded his presentation on video and can now watch and listen to it again. His conclusion regarding cars and biofuels is that a common flow of cars along a road requires a strip of land 8 kilometres wide surrounding it to grow the biofuel for the cars. He then discussed how much energy per square metre and per person various nations consume. For some nations their entire surface area would be insufficient to provide for their bioenergy needs. We were then given a review of other renewable solutions. He compared electricity generation by Swedish nuclear reactors per square kilometre with electricity production by wind energy and asserted that wind energy requires an area 400 times larger. He concluded by showing that we can reduce our personal energy consumption by other patterns of living. I had the opportunity to give him a printed copy of my book as thanks for the copy of his book that I received when we met in London. After the speech welcoming people to the dialogue, it was time for Energy Minister Anna-Karin Hatt to lead off. As an introduction, she asserted that this dialogue between politicians, leaders of industry and researchers was very important but that it was also difficult to gauge its importance for the future. She mentioned quite rightly that coal use generates the largest emissions of carbon dioxide but her assertion that coal is still the world’s largest energy source was not correct. For the past 60 years oil has been the largest source of energy and it is important to understand that it is the transport sector that requires this oil. Most coal is used for electricity generation. The clearest political message that she delivered was that a global agreement is needed on trade in rights to emit greenhouse gases and she pointed out that our actions and choices as private individuals are also important. After the seminar I asked whether she had read my book that she received one year ago and the answer was, unfortunately, no. 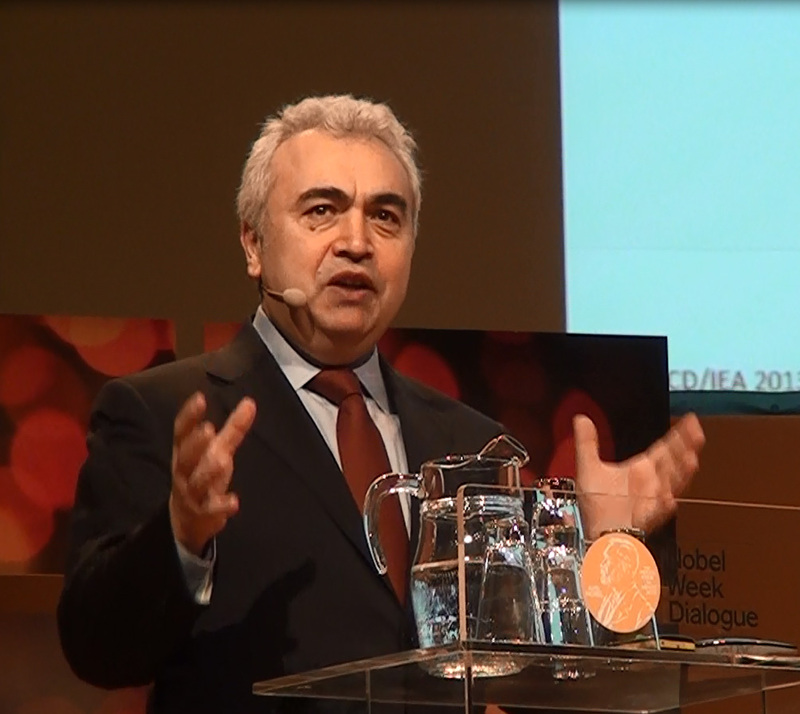 The next speaker was Dr Fatih Birol, Chief Economist for the International Energy Agency, IEA. (The IEA is the OECD nations’ energy agency and does not represent the UN or the rest of the global community.) He wanted to describe our current energy system and the changes we had seen in recent years. He described that nations that had been energy importers have transformed into significant future exporters of energy. As an example he mentioned that the USA had once been an importer of gas but had now become a significant gas exporter and that this transformation was due to the so-called shale gas revolution. The other new energy exporting nation was Brazil that the IEA considers will become a significant exporter of oil in around 2015. The USA is currently an energy exporter in terms of coal. Today the USA imports natural gas from Canada and the question is whether they will be able to do without this importation in future. 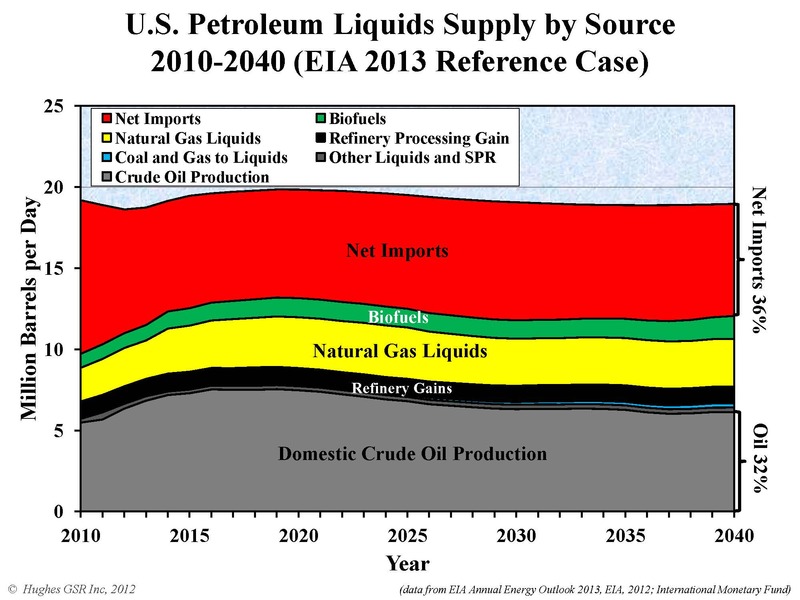 In the figure below you can see that the USA today is experiencing plateau production of natural gas. 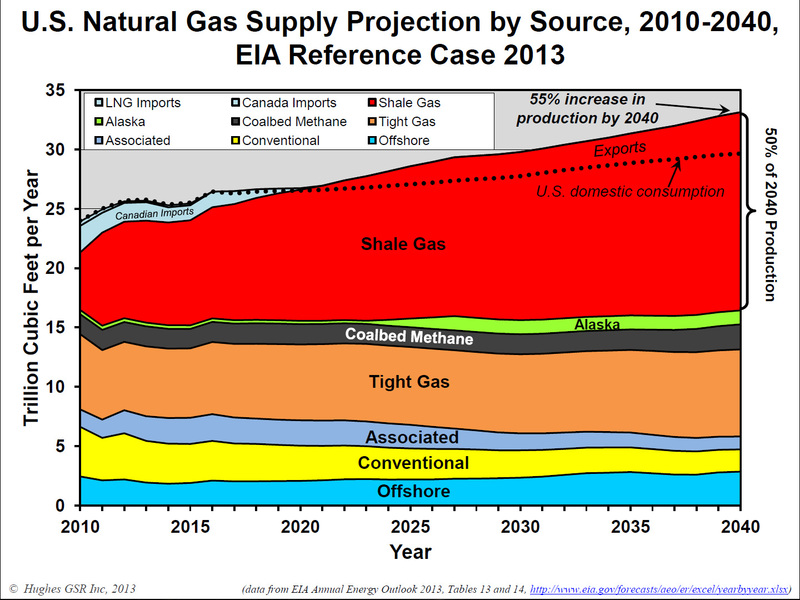 In order to become a future exporter of gas, production of shale gas will have to increase markedly in future. Four of the five largest shale gas fields in the USA have together seen maximum production and production has begun to decline. At the moment it is production from the Marcellus Shale that is increasing and this increase compensates for the decline from the other fields. If this can continue in the future remains to be seen. Increased natural gas deliveries from Alaska have also been forecast (by the USA’s Energy Information Agency, EIA) although, to be realised, this will require increased natural gas prices. Whether a questionable export volume of natural gas amounting to less than 10% of total American production (see the figure) can be regarded as significant is for you to judge. Once again ‘peak” had entered the discussion but it was demand that was seen as peaking not the production from reserves, i.e. energy flow. It is the “flow” of energy that my research group studies and it is in the flow of oil that we see a production maximum occurring. Of course, I gave a copy of my book to Svanberg and he promised to read it over the Christmas holidays. We will see what becomes of that. Climate was an important part of Carl-Henric Svanberg’s presentation and many in the audience were doubtless amazed at this statement, “The most important step, in my view, to take is to put a price on carbon. Personally, I can’t understand why those burning carbon can do so for free.” If there had been discussion of taxing those who produce products that release carbon dioxide upon burning he may have adopted a different tone. Moderator Chris Liewellyn Smith, Christof Rühl, Rajendra K. Pachauri, Fahti Birol, Nebojsa Nakicenovic and Anna-Karin Hatt. In the panel debate that followed Energy Minister Hatt and Dr Birol were included but BP’s corner was defended by its Economics head Christof Rühl. The other participants were the IPCC’s chair, Rajendra K. Pachauri and the Director of IIASA, Nebojsa Nakicenovic. I have never seen a more star-packed energy panel. To begin, those new on the stage were given a chance to make a contribution. First out was Christof Rühl from BP and he complemented his Chairman’s presentation by noting that in BP’s Energy Outlook report, the energy figure stated for 2030 was not estimated demand but, rather, what BP really believes energy production will be. By this he meant that the report was based on BP’s experience and statistics. I have gone over their publication briefly and must state that it lacks detailed references and it is impossible to follow how BP arrived at its conclusions or the partial results that are also presented as graphs. Page 34 of BP’s Outlook report shows the oil production that they expect. The only thing I will say about this at the moment is that their figure for “Tight Oil” production of 6.5 million barrels per day from the USA in 2030 is not within the bounds of possibility. I will return to this issue at a later date. The IPCC’s chairperson Rajenda K. Pachauri made a short introduction and was most concerned over how the world’s poorest people could access a share of the energy that they need to move out of poverty at the same time as we simultaneously reduce our emissions. The relevant analyses that exist are insufficient and large efforts/investment is required in this area. He encouraged us also to study dream scenarios even if the technology to realise them does not exist today. The most important remark made by Nebojsa Nakicenovic of the IIASA is that we must look farther forward than 20 years in the future to what changes will be happening. If the scenarios that are being discussed are extended only to 2050 then even the most optimistic scenarios show consequences from limited resources and reserves. If one looks back in time it is simple to see the technical changes we have experienced and it is future technology that we must now focus on. I do not want to discuss the debate but those who are interested can use the link given above. Energy Minister Hatt closed the mornings panel debate with the assertion that, “The best help that we politicians can receive is facts that are true and established and that the truth is told because we really must be certain that the decisions we make are based on the best knowledge that we have”. As researchers we try as hard as we can but, in reality, politicians must also listen to us. There is not sufficient time for me to discuss the rest of the event but here are some reflections. It is as a researcher that I would like to discuss the truth that other researchers, politicians and industry representatives presented. First we can state that many of the world’s leaders in this area were present but we also lacked many significant players in the energy arena. It was correctly stated that we are approximately 80% dependent on fossil fuels. The uncertainties in this figure lie in how various actors consider non-commercial bioenergy. There were no researchers present who asserted that there is no connection between increased emissions of carbon dioxide from fossil fuels and the temperature increase that has been observed during the last 50 years. Those representing industry, in this case BP, asserted by their calculations that by 2030 we will be using more oil, gas and coal. The IEA, as a representative of the politicians, asserted the same in its main scenario. The message from the researchers was that this increase in fossil fuel use will affect our future climate and that this will mean there is no sea ice at the North Pole in 2035. One of the Nobel Prize laureates asserted that economics is not an area of scientific research and it is true that there is no Nobel Prize in Economics. However, the fact that the Nobel Committee now awards “The Sveriges Riksbank Prize in Economic Sciences in Memory of Alfred Nobel” shows that economics is important. Regarding the coupling between energy and the economy it was noted in passing that the economic growth we experienced during the 20th century would not have been possible without increased energy use. It is this coupling that is the politicians’ greatest dilemma. We can state that Sweden’s fantastic growth from 1945 until the energy crisis in 1973 was coupled to our enormous increase in oil consumption. The same relationship exists today between China’s increased use of fossil fuels and their economic growth. Today it is impossible for politicians to make decisions that hinder a nation’s economic growth so it is easier to not make any decisions at all. The climate conference in Copenhagen 2009 was clear evidence of this. But fundamentally, an economy is food for the day and a roof over our head – the things that are most important for us all. We know the scale of the fossil fuel reserves that we have and which nations can extract these and thus release future carbon dioxide. I call these (a little jokingly) the “Drug Lords”. In reality, it is 15 nations that have fossil fuel reserves equivalent to 85% of future possible carbon dioxide emissions. It is use of coal that generates the most carbon dioxide and it is the world’s five largest coal producing nations, USA, Russia, China, Australia and India that will determine future emissions. 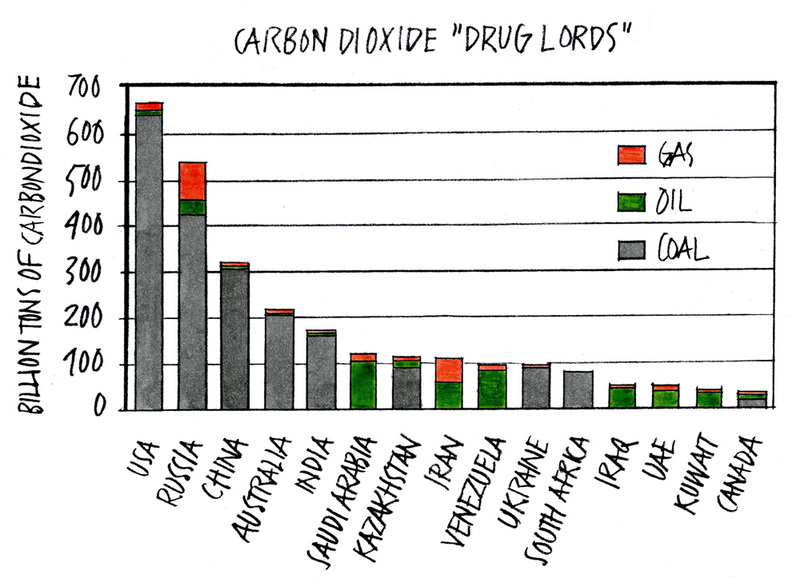 Thus, reduced emissions requires that that these nations reduce their mining of coal. We now see that the USA is substituting some of its coal use with cheap natural gas but the mining of coal continues. Cheap energy is the “drug” we crave and the EU buys cheap coal from the USA and is using it to replace, among other things, natural gas use that is expensive in the EU. 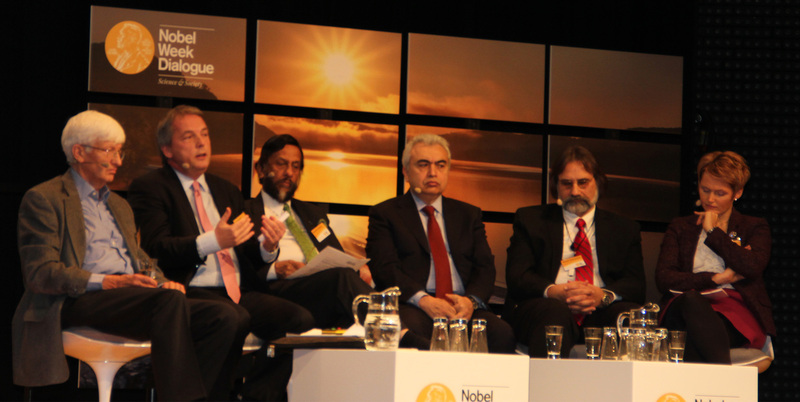 The main people in the dialogue in Gothenburg were, naturally, the six Nobel Prize winners. The fact that four of these are working in the USA, with former Energy Secretary Stephen Chu setting the tone, meant indirectly that the future of energy was discussed from an American perspective. However, that does not mean that the truth was obscured. Nobel Prize winner Chu reviewed very clearly the climate changes that can be seen and what ideas might form the basis for change in the future – he has the knowledge. The fact that he was recently the USA’s Secretary of Energy and has the knowledge that Energy Minister Hatt is looking for, but nevertheless could not succeed as a politician in driving through change in the USA, shows clearly the problems we face in future. The fact is that it is economic reality that really calls the shots. It is food, a roof over our head (and the ability to pay for it) that are the most important for us all and this means that a future dialogue must include the underlying factors that support the world’s economy and how a future economy can be coupled to new energy systems. We should also remember that this is a future that must now be constructed late in the day and that must be discussed with more than only the world’s wealthy people in mind.